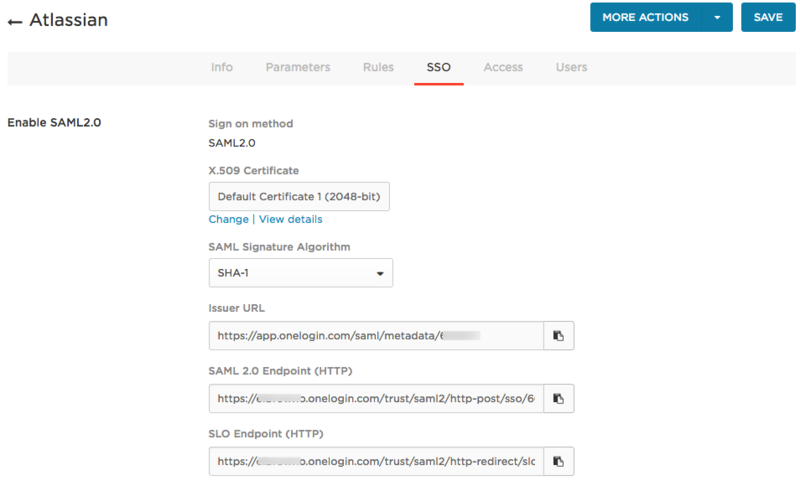 This article describes how to configure OneLogin to provide SSO for Atlassian Cloud apps using SAML. In order to enable SAML single sign-on for Atlassian Cloud products you'll need to set up Identity Manager. Learn more about Identity Manager. This connector works as a catch-all for all of your Atlassian Cloud apps, and works for both Service Provider (SP)-initiated SSO and Identity Provider (IdP)-initiated SSO from your OneLogin Portal. If your organization uses more than one Atlassian Cloud app, clicking the app on your OneLogin Portal will take your users to the "default" Atlassian Cloud app, where they can click the application navigator ("hamburger") button to choose which Atlassian Cloud app they want. Your OneLogin users must be members of a verified domain in your Atlassian account. Only those users will be able to use SSO to log into Atlassian Cloud apps using SAML. You can verify domains by navigating to Atlassian Site Administration > Organizations & Security > Your organization > Domains. Go to Apps > Add Apps, search for Atlassian Cloud, and select it. Tip. If you're setting up IdP-initiated SSO for a specific Atlassian Cloud app, such as JIRA or Confluence, you can change the Display name of the app here to reflect the app name that your users expect to see. When you click Save, the Info tab appears. Optionally you may also add your Atlassian Site URL. This is required if you wish to launch the app from within OneLogin. If you don't enter a value here, your users will not be able to launch their Atlassian Cloud apps from the OneLogin portal. If you want IdP-initiated SSO (launching apps from the OneLogin portal), you must enter the URL of your Atlassian Cloud account here. In other words, enter your JIRA Cloud or Confluence Cloud URL here. If you have multiple Atlassian Cloud apps, enter the URL for one of them here. Your users will be able to select other Atlassian Cloud apps from the Atlassian interface when they are logged in. See the introduction to this article, above, for an example. Enter the entire URL, including protocol. For example, https://acme.atlassian.net. Go to the SSO tab to view the values that you'll copy to your Atlassian Cloud account in the steps that follow. Open a new browser tab and log in to your Atlassian Cloud account as an admin. If you have already Enabled SSO for you Atlassian account skip this step and proceed to step 9, otherwise. Go to Site Administration > Single sign-on. Toggle the Enable single sign-on switch to opt in to the new Atlassian account login. NOTE: If this option isn't available in your account, contact Atlassian Support. SSO will not succeed unless SAML is enabled. To get the X.509 Certificate, click View Details to open the certificate page. Copy the entire X.509 Certificate, including "----BEGIN CERTIFICATE----" and "----END CERTIFICATE----." Paste the X.509 Certificate in its entirety into the x.509 field. Include "----BEGIN CERTIFICATE----" and "----END CERTIFICATE----." Go to the Parameters tab to verify the OneLogin attribute Values that will map to the Atlassian Cloud Fields in SAML requests. In most cases, you should keep the default mappings. If you need to change a mapping, click the parameter row to open the Edit Field Fieldname dialog, where you can select the OneLogin attribute Value you want to use. Go to the OneLogin Access tab to assign the OneLogin roles that should have access to Atlassian Cloud and provide any app security policy that you want to apply to Atlassian Cloud users. Note. You may want to give access to yourself or a test account and test your completed OneLogin SAML integration with Atlassian Cloud before you assign additional roles on this tab. See step 16, below. Ensure that you have a user account in both OneLogin and Atlassian Cloud that uses the same email. Make sure that you are logged out of Atlassian Cloud. Go to your Atlassian Cloud login page before your OneLogin session ends. If the test user is granted access to Atlassian Cloud without having to provide login credentials, then SAML works. You can find more information to help troubleshoot your Atlassian Cloud SAML integration in the Atlassian Cloud documentation.